We all have streams to ford in our lifetime. Some are shallow creeks with easy stepping stones. They offer little in the way of experience. Others, more challenging and daunting, are like raging currents, daring you to cross. The bigger, more challenging streams build character, memories that last for years, and build wisdom if you are so inclined to receive the message. Expressed through dogs, rainy days and relationships, you are invited to share this collection of work created sporadically over many years including author’s notes on each piece, to give insight for what inspired the work. It is written mostly in free verse, forcing you to focus, perhaps to find your own meter. It consists of 35 works, and the significance of that number is subtly revealed within. This work is for you who have faced and continue to face your own streams, gained personal insight, and made your own fateful decisions. NOW AVAILABLE ON KINDLE, TOO. 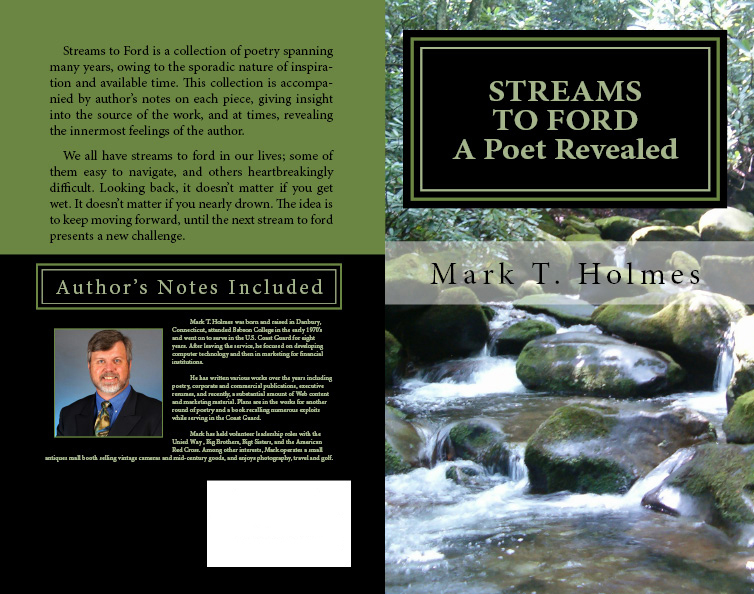 Streams to Ford is available in 5"x8" soft cover or Kindle format (coming soon) on Amazon.com. Please click on the How to Order page above for more information and a direct link.